Wrae Tower is a 16th century stone tower house, probably founded by the Tweedies of Wrae. The only fragment of standing masonry is the north-east half of a rectangular stair-tower, the stair only led to the first floor because above this was a room and an attic. A single jamb containing a bar-hole represents the north-west ground floor entrance to the tower and crowning the north-east wall is rough corbelling, which supports the remains of a parapet. 11 miles north-east is Neidpath Castle. 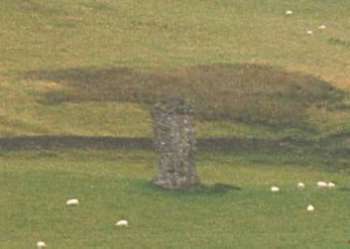 Wrae Tower is located south of Broughton, off the A701. 12 miles south-west of Peebles, on the A72-A712.